Add to Bouquet/Gift*: Add 6 more Mini Oreo Pops to Gift [Add $10.00] No, Thanks! Would you like to add to this gift? 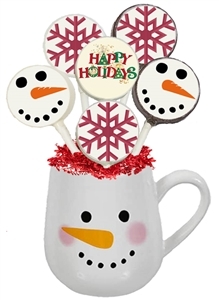 6 or 12 of our new Mini Oreo Pops are dressed up with Holiday icon images. Choose Winter Theme (ex, snowflakes, snowman) or Christmas Theme (ex. Santa, bells, trees). These little bite sized Oreo pops are arranged in our most adorable snowman ceramic mugs (may vary). Mugs are 4"H X 3"Opening. Holds 12 oz. Sorry, these can not be personalized!